I was paired up with Lacey from Humming Right Along. We swapped emails and got to know each other better. She lives in Durham, North Carolina (which admittedly I have no idea where that is in North Carolina aside from its proximity to Tree Hill..hahah One Tree Hill anyone?!) She also loves crafts, coffee and crafts. Other basics from the swap were favorite summer movie being 500 days of Summer ( which I still have yet to see). 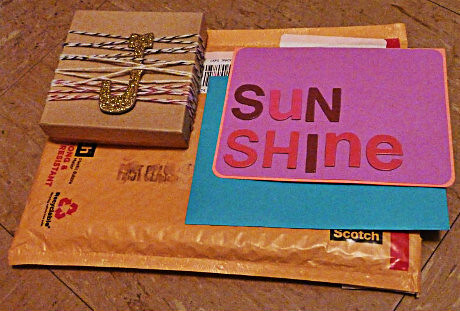 Lacey sent me this sweet package done up very cute and crafty! Inside were nestled two bracelets! one was a beautiful turquoise and black mix and the other definitely reminded me of Chicklet gum just as she said 🙂 I absolutely love them! I’ve actually been wearing them the past 2 days for work. 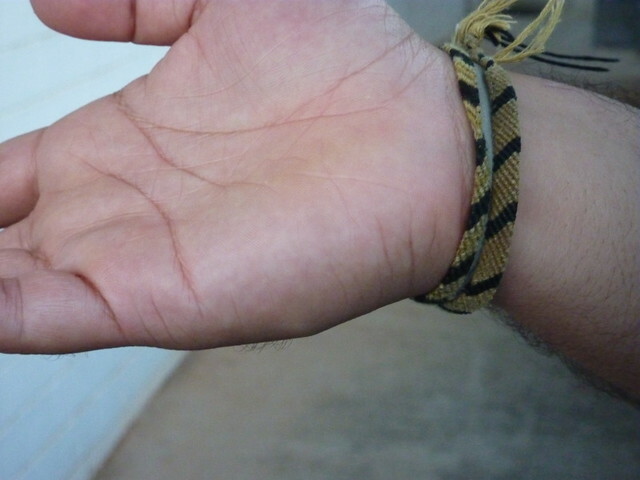 Here’s how the bracelets look paired together on my arm by themselves. 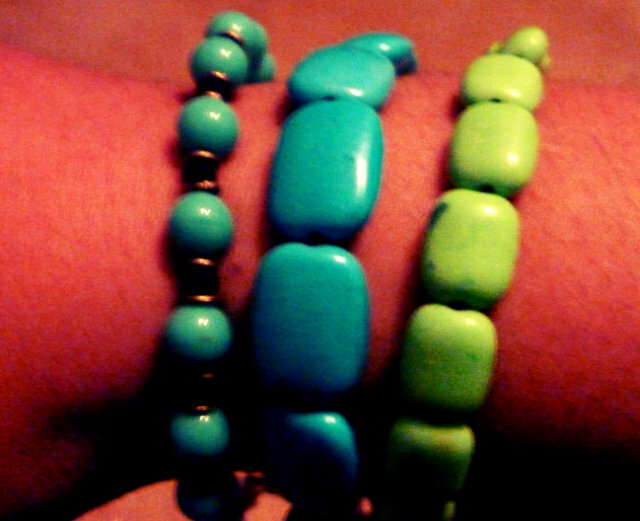 Both bracelets have been so lucky lately to have been mingling on my arm with other bracelets and my hairtie! Thanks once again Lacey for being my partner in this swap and don’t forget to check out her blog and post on the swap. Much thanks also to Ilene and Lenora for putting together the swap. And for all those that participated I can’t wait to see your posts! Oh I also wanted to add one last note KonaBoy has been having an arm party all on his own the whole summer. 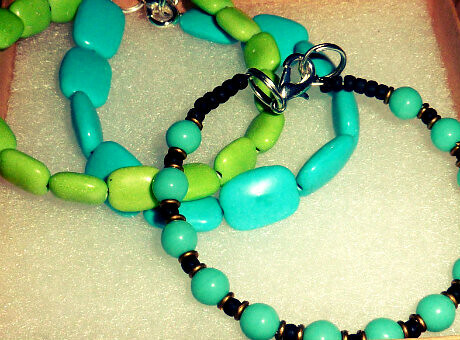 There are 2 knotted friendship bracelets of different sizes and somewhere mixed in between in a brazililet wish bracelet. Love that he’s been arm partying with me! See you very soon ( I hope!)! I love those!! I love the colors! !